Are snails born with shells? Are snails right or left handed? How did the land snail evolve? How long do snails live? What role do snails play in the environment? 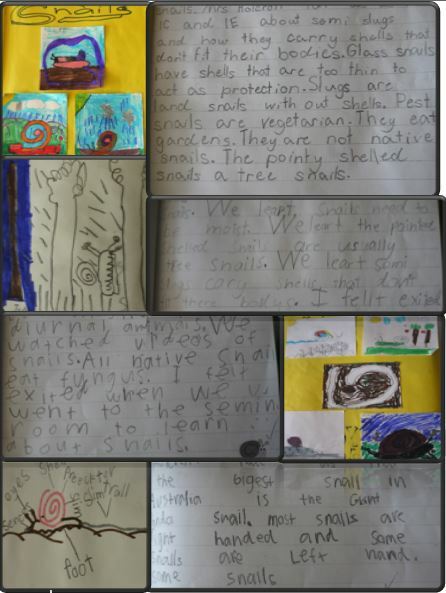 Congratulations to 1C at Samford State School – our newest Junior Snail Whisperers. They have been learning about nocturnal and diurnal animals in science and have found out that snails are mainly nocturnal but have many interesting features! This entry was posted in Land snails by The Snail Whisperer. Bookmark the permalink. Students and teachers are permitted to use this information for school projects and homework. © Dr John Stanisic and Facts About Snails, 2013–2014. Photos and text on this site are strictly copyright of the respective authors. Unauthorized use and/or duplication of this material without express and written permission from this blog’s author and/or owner is strictly prohibited. Excerpts and links may be used, provided that full and clear credit is given to Dr John Stanisic and Facts About Snails with appropriate and specific direction to the original content. Buy the field guide to eastern Australian species. In the Queensland Museum bookshop now.